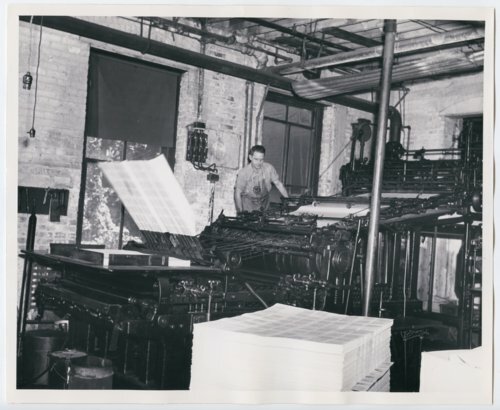 This is a photograph of the printing room at the Haldeman-Julius publishing company in Girard, Kansas. In 1919 Emanuel and Marcet Haldeman-Julius purchased Appeal to Reason and its printing plant in Girard, Kansas. The Haldeman-Juliuses wrote and published their own work, including the novel Dust, published in 1921. They also began publishing what became known as the Little Blue Books: 3 ½ by 5-inch reprints of classical, educational, biographical, and other literature with heavy-paper covers. Originally the books were 25 cents each, but with mass advertising and greater volume, the price was reduced to a dime, later to a nickel. From 1919 until 1951, the Haldeman-Julius Press of Girard, printed more than 500,000,000 of the famous Little Blue Books in over 6,000 different titles.